A subtle blend of oriental teas scented with the elegant fragrance of bergamot. A favourite English beverage usually served without milk. The aroma of the dry leaf is a very powerful bergamot scent, but upon brewing the fragrance softens considerably. The actual flavor is much smoother than I had anticipated, generally when the tea has such a strong scent, the brewed tea tends to be strong (and sometimes too strong to the point of being perfume-y) but that isn’t a worry here. The bergamot here leans stronger toward the citrus-y notes of a bergamot orange than the floral-esque notes of the bergamot. The black tea base is quite mild and this lends itself to the overall smooth flavor of the cup. There is some astringency which is clean and dry, but not overwhelmingly so. This would make a nice late morning or early afternoon tea. 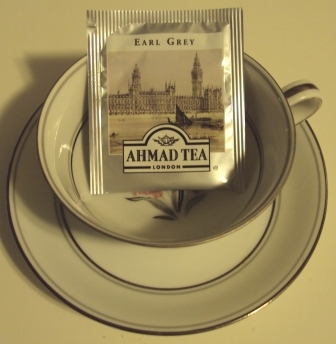 This is not my favorite Earl Grey tea, but, it makes a decent cuppa, and it would be a good one for those of you who find most Earl Grey teas to be too strongly flavored with bergamot, because the flavoring here is much more mellow. Not bad, not bad at all.